Here’s a picture of the world’s largest seated buddha. It is on Lantau Island, one of the over 200 island that make up Hong Kong. I have a million pictures (including one with the buddha and my gnome!). I’ll upload my pictures once I get back. Where is the world’s largest standing Buddha? 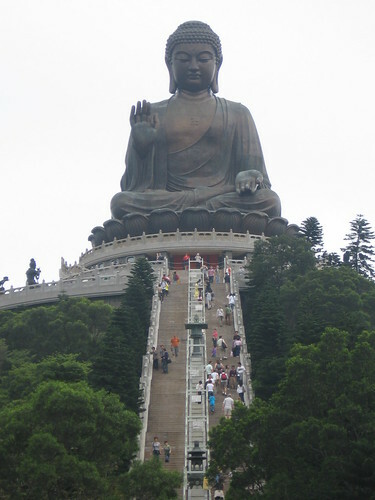 Tallest standing Buddha statue is the Spring Temple Buddha China measuring 502 ft.!!!! )Source: Wikipedia – Sept 2012. I’m not sure it counts because there’s no Buddha belly. The belly is what brings all the luck and good karma. But you gotta rub it first. Did you take a Buddha picture with your I’m Sorry You Feel That Way tote??? Man!!! watte view!!! M rely crazy abt de buddhist religion!! Hi Bronson, I am doing a simple short video about Buddha. Can I use this Photo for that?